Some may feel that not calling these places by their Tibetan names may not be a big issue so long as the incidents are being reported, I would argue otherwise. Professor Carole McGranahan brought up an important issue that I’d like to reiterate. These self-immolation’s, protests, and shootings are taking place in Tibet and they are being reported and, therefore, recorded. How these incidents are reported now will affect how it will be remembered tomorrow. They will become (is now already) part of history and we need history to remember that these incidents happened in AMDO, TIBET not QINHAI, CHINA. As our fellow Tibetans in Tibet are endangering their safety to let the world know of China’s unwanted colonial control, those of us outside should do what we can to make sure journalists (and more) record history correctly that these incidents took place in TIBET. I thank Stand Up for Tibet and others for already taking this initiative. Thanks for pointing this out, it’s very important indeed. The media is getting away with all kinds of laughable geographic terms. Check this line from LA Times: “Tibetans call the area “East Tibet” – http://latimesblogs.latimes.com/world_now/2012/01/china-tibet-self-immolation-sichuan-dalai-lama-india-lunar-new-year-dragon.html – well what else would we call the area in the eastern part of Tibet!? Worse still is when the term “Tibetan areas” are used, probably the worst is the term “ethnic Tibetans” – as opposed to what kind of Tibetans, non-ethnic? You’ve made a good point especially with regard to how these events will be remembered in history. Unfortunately China renamed Tibetan city’s, provinces etc..as all good colonizers do, making it difficult for journalists uneducated about Tibet’s history to know what the Tibetan names are. 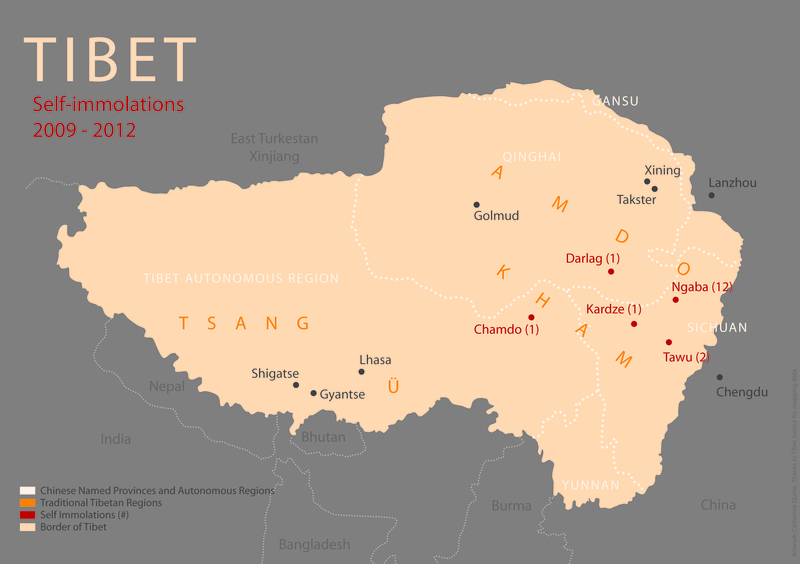 Perhaps providing the AP and Reuters with Tibetan maps that show the Tibetan names of each area and translations from Chinese to Tibetan would be helpful. That is as long as their corporate owners in bed with the PRC would allow such a thing! I agree with you all the way. From now let us all ask or write to your local papers or TV news to mention true tibetan names for places or people and not by chinese names as those are wrong due different culture and language. First of all we tibetan people must call or write true names of our places and people. I see almost all our people specially so called government staffs always use chinese names. They may be educated in china may they want to show off how good they in chinese language. But tibet belongs to us and we names in our own language, all those places have names before chinese came there. We also respect chinese names in china.We call our land, LAND OF SNOW and you can call your land, LAND OF DEATH. That is the truth. A certain amount of this confusion stems from the acceptance of the area designated in Chinese as Xizang as that area that should be called “Tibet.” I put something up on the web some time ago that bears on this and which might be of interest to some Lkakar readers. Please excuse the self-promotion! We are more than happy to have you post your article.